The most reliable and crystal clear wedding DJ services in the country, with videos and on camera testimonials all for one specific DJ. The most packed dance floors and the best comments for the music are right here! 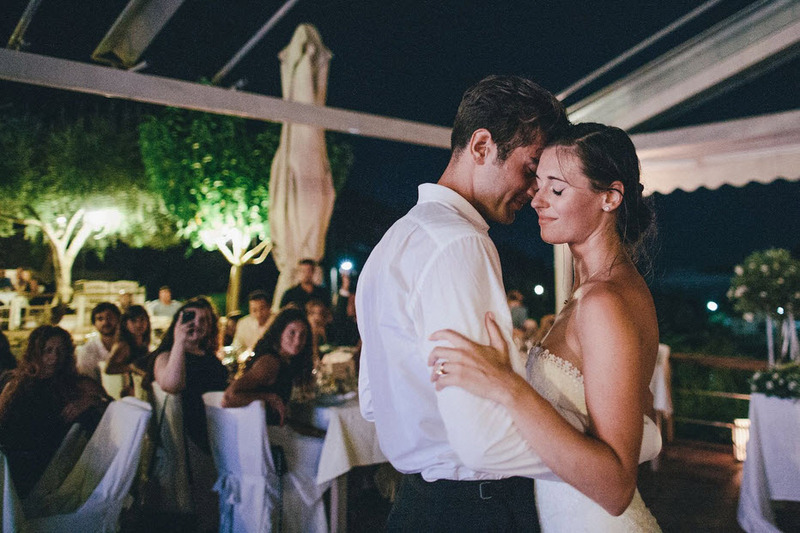 From receptions at simple tavernas to the best hotels in Santorini and Athens. So much more than just photos of DJ equipment by the sunset, you can see the different style of each wedding and how certain everybody was when talking about the music. Destination weddings usually consist of fewer guests, but this shouldn't lower your expectations of having a great party. Because your guests will be your most beloved ones (who are usually more eager to dance), because you will all be in a "vacation in a Greek island" mood, because you will have the right dj! In the following videos, guests vary from 18 to 150 people. Video quality may vary too as those videos are not the official. More videos from traditional and modern Greek weddings following at the end of this page. Even better songs waiting for you, too good to be revealed at a video. Trevor and Shelley from Dubai, English wedding. A FAIRYTALE WEDDING IN DOHA, HOSTED BY THE EMIR OF QATAR. A very special - and demanding in terms of music - wedding reception, having Hamad bin Khalifa al-Thani (recently emir of Qatar)) as best man. The pre-wedding party and the wedding reception were held at the luxurious hotel “La Cigale” in Doha. Α medley of Greek, Arab and international hits for guests of all ages coming from Greece, U.K. and Qatar. There was also a big jazz band and everyone had an unforgettable time till 5.30 in the morning! You can read more here. A crazy party at Faros Resort Hotel that lasted till 8.00 am! English subtitles available (press "CC" at the player). Dylan is a composer and producer, Clare is an actress and dancer. Their friends where all from the same side with lots of artists, actors and dancers ready for some crazy party. Jazzy tunes and movie scores during dinner and old school break beats and r'n'b at the party which started with "Incredible" by M Beat. The cheesy classics were strictly prohibited! One day in Santorini, a long time before starting DJing at destination weddings, after watching the sunset in Imerovigli (the locals will tell you that this is the place with the best view, not Oia), I was passing from a hotel and listened to some beautiful lounge - jazzy music. Curious enough, I stepped inside and became a wedding crasher to watch a very special wedding reception. I was amazed by the quality of this hotel, the view to the caldera and the wonderful jazzy tunes playing at that moment. So, after some years it was my turn! The dinner music matters a lot at places like this, it should match that stunning view! Modern Arabic wedding at Blue Palace Resort in Elounda, Crete island. 60 guests from Canada, Jordan and around the world. Top 40 and house music, some older classics, '90s and a little bit of quality Arabic music. Not captured by the official video, the party continued at an indoors place after 12.00. A Greek couple with special tastes in music living in France, their friends and colleagues from different countries and more traditional relatives living in Greece. Can they all be satisfied? The answer on this video. Don't miss what the bride's father said about the music at the end! WATCH WHAT THE COUPLE SAID ON THIS VIDEO TILL THE END! Wedding at the Volcano View hotel in Santorini with 60 guests. A reception that had almost everything: The cool lounge at the cocktails hour, the jazzy dinner, the top 40, the big fat Greek party, the merengue, the old school hip hop, the after party with eclectic house, soul and funky breakbeats. Always an honor to be selected by couples with great music taste. I knew that from our first Skype meeting: When Eric reached at one point for his phone trying to show me what kind of "classic house" tunes he meant - and I went at the same time on YouTube - we had gone for the same (rare) song! English wedding at the beautiful Poseidonion hotel in Spetses island. "Live" action after 0.45''. I love it when couples surprise me with their music requests. When I saw how the couple on the last scene of this video was reacting to my music selections from very early on dinner time, I said to Anna Roussos the photographer: Those guests are mine! You can watch more videos at this page. English subtitles available (press "CC" at the player). An alternative English wedding in Hydra that lasted till 5.30 in the morning. When I started playing the last songs of the party a guest came to say some great things about the music! Thankfully my assistant was nearby. Wedding in Santorini. The couple (Greek and Serbian - Indonesian) couldn't have found a more suitable way for their arrival at Pyrgos Restaurant as they both work for the Emirates Airlines in Dubai. Asterios is the international event manager of Emirates, he has worked with famous artists around the world and this is why it was a great honor to select me. 80 guests from U.K., Cyprus, Serbia, Australia, United Arab Emirates. Live Greek music by Manolis Fitros' orchestra, perhaps the best and craziest in the island. Dance floor lighting and led uplighting. Dasha and Steve from Chicago had only 18 guests for their American - Russian wedding at Pantheon Villas in Santorini and had some picky tastes. Jazz, swing, latin, along with today's top 40. Absolutely no disco and no '80s! Despite having such a small group of guests and many of the usual party classics out of the playlist Panos was still able to keep the dance floor packed for the majority of the night. From Steven's words, "...we got a full wedding"! Are you eloping or having a small reception with family and close friends? You don't have to worry that nobody will dance, with the right DJ behind the decks these types of parties can be some of the most fun! This French couple from Dubai organized their wedding in Paros island. Guests came from all over the world. 80 people dancing like crazy till the sun came up! Mainstrem house and electro 90% of the time, along with some rnb and latin music. Listen here to a compilation based on their dinner music. Here's what the couple said about the wedding party the day after. Dimitri and Anastasia, Greek-Russian from Ottawa, Canada, organized their wedding in Paros island. Guests came from Greece, Russia and Canada. 80 people dancing like 200! Greek-Italian wedding in Kyparissi, Monemvasia. Alternative music for the coctails hour, smooth and happy jazz for dinner time, big fat Greek craziness and USA top 40 for the party along with some Italian and older classics. A very high energy reception from the beginning, many guests were dancing even on dinner time at my jazzy tunes! Photography by Theodoros Chliapas. Testimonial for an alternative wedding in Killini. Hatef takes good care of my communication with foreign couples as he works for Skype U.K.! Wedding at at a Greek taverna by the port of Kythnos island. "The cake and the DJ were perfect". Off camera comments can sometimes say more with fewer words! Greeks and Russians unite! I shouldn't had stopped the video so early, next song was "I gotta feeling" from Black Eyed Peas and the party exploded... Multicultural weddings can be difficult, with the right DJ everybody will end up dancing like old friends from the past. Guests arrived at 1.00 pm and the party ended at 23.30! Winter wonderland wedding at Grand Bretagne, the premier hotel of Athens. The bride and the groom both raised in New York, guests came from New York and Kefalonia island. Top 40 & American classics, island music from Kefalonia, quality Greek pop '80s. Four moving head lights at the dance floor. The couple said later: "We had a great time, the music was uplifting and to the point. Panos is a very good guy, very cooperative, he worked very hard for this night and the result was really great!" Alternative wedding at a summer house in Pylos. "Panos, grab yourself a mojito and play whatever you like". The couple wanted a party different from the usual wedding receptions with music and drinks straight from their favorite hip bars in central Athens. Apart from this short brief I was granted complete freedom for the music. Rock, latin, swing, quality party classics for the older guests and just a few of carefully selected Greek songs. 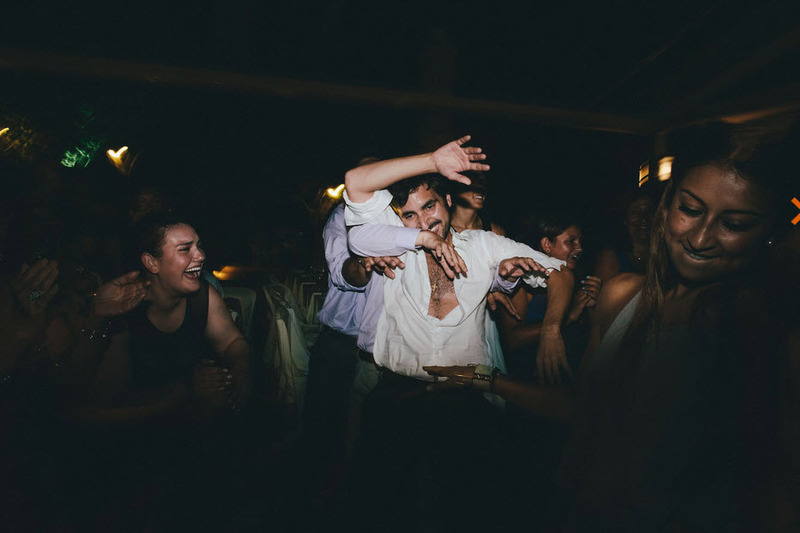 Translated review from Wedding Wire: "There's no need for too many words... Panos is an incredible guy, a professional with an amazing knowledge of music. Selecting him will make you proud... We had a great time!". Wedding at Chevalier Estate in Athens. The party started with traditional dimotika and laika with many hits from Kiamos and Pantelidis, mainstream Top 40, 80s, disco, rock 'n roll, r'n'b, and all multiplied by two till the morning. The couple said: "It's six o clock in the morning, we're totally satisfied with Panos, he's very easy to cooperate, we wish him the best!". Dancing sardana, nisiotika & more! The sardana [sərˈðanə], is a type of circle dance typical of Catalonia, Spain. Nisiotika (Greek: νησιώτικα) is the name of the songs and dances of Greek islands.